Jenni at C.M.S. was alerted when a Videofied Motion Detector was triggered when intruders with firearms broke into a remote site. Shots were fired and C.M.S called 911. Police quickly responded and one gunman and accomplice were subsequently arrested. While the police were at the location, Jenni was able to alert officers other 'gang members' were entering the site and the Police were able to take appropriate action. The Police were grateful and the keyholder thanked Jenni personally for her help. 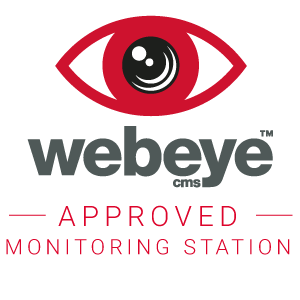 A Webeye Approved Monitoring Station is a new service offered by Webeye. It is for situations when you are unable to respond to a webeyeCMS alarm notification or when you just want someone else to monitor your alarms. At whatever point you wish, alarms can now be escalated to a monitoring station who will take appropriate action on your behalf.